State, federal and non-profit biologists released ten fishers today in the Nisqually River watershed of Mount Rainier National Park as part of a collaborative effort to restore the species to Washington. Fishers, a housecat sized member of the weasel family, were eliminated from Washington by the mid-1900s through over-trapping and habitat loss. They have been listed as a state-endangered species since 1998. 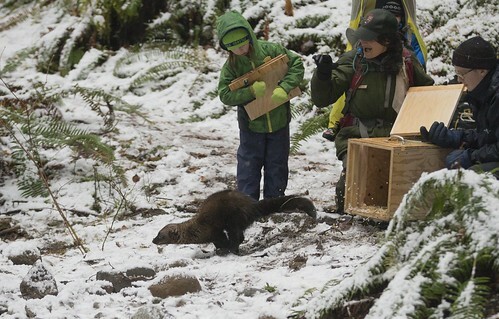 The four female and six male fishers released today were captured in British Columbia as part of a multi-year project to reintroduce 80 fishers to the southern Cascades. They underwent veterinary checkups and were equipped with a radio transmitter to allow biologists to track the animal’s movements. The reintroduction was made possible by the Washington Department of Fish and Wildlife (WDFW), the National Park Service, Conservation Northwest and other partners. Last year these partners released 23 fishers, 11 females and 12 males, in the southern Cascades on Gifford Pinchot National Forest. Releases in the northern Cascades are planned for coming years. Joining the partners in today’s event were representatives from the Nisqually Tribe, the Cowlitz Tribe, and two Canadian First Nations bands, the Nemiah Valley Indian Band from the Chilcotin (Tsilhqot’in) Nation and the Williams Lake Indian Band from the Northern Shuswap (Secwepemc) Nation. WDFW and the National Park Service are coordinating the monitoring of the state’s reintroduced fishers. 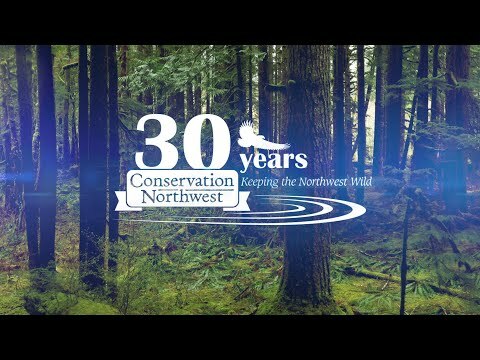 Conservation Northwest is supporting ongoing fisher monitoring with volunteers and remote cameras through its Citizen Wildlife Monitoring Project. These partners worked together from 2008 to 2010 to release 90 fishers in Olympic National Park. Monitoring efforts show that the released animals have distributed themselves throughout the Olympic Peninsula and have successful reproduced. Updates about the released fishers are posted on the WDFW website, http://wdfw.wa.gov/conservation/fisher/reintroduction_cascades.html. Fishers are related to minks and otters and are native to the forests of Washington, including the Cascade mountain range. This elusive carnivore preys on various small mammals – mountain beavers, squirrels and snowshoe hares – and it is one of the few predators of porcupines. Re-establishing viable populations of fishers in the Olympic and Cascade Mountains are important steps to down-listing the species in Washington State. The state recovery plan and implementation plan for fisher reintroduction in the Cascades can be found at: http://wdfd.wa.gov/conservation/fisher/reintroduction_cascades.html. Sources of funding for the reintroductions include the Washington Department of Fish & Wildlife, the National Park Service, Conservation Northwest, the U.S. Fish and Wildlife Service, Washington’s National Park Fund, state wildlife grants, Washington State personalized license plates, and funds from other partners. More information is also available at www.conservationnw.org/fishers.